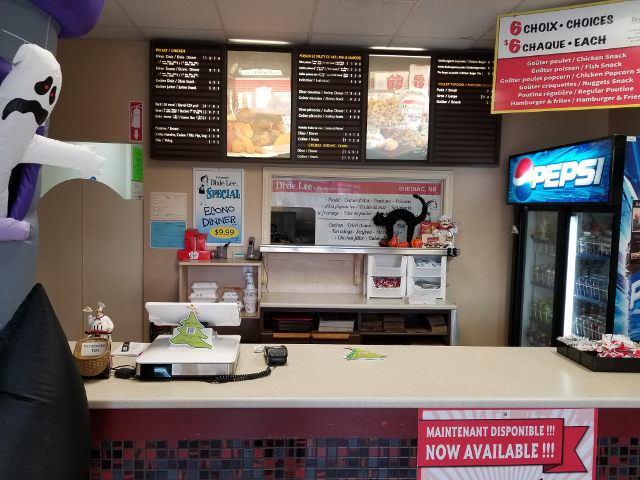 Anik Roy, manager at Dixie Lee in Shediac, NB, enjoys the daily excitement of saying hello to regular patrons and meeting people trying out the restaurant for the first time. Dixie Lee is a fast food franchise specializing in fried chicken and all the trimmings. With their special ingredients and daily fresh chicken, the 3-piece meal is a favourite among locals. If fried chicken is not for you, then try out any number of amazing dishes from the extensive menu. This is the second year Roy and her staff have participated in the Tree of Hope Campaign raising funds “to make the lives of cancer patients and their families better,” she said. Roy and her dedicated staff have set a goal of raising $3000 for the Tree of Hope campaign. They have already reached $1000. Check out the donation level and the progress of fundraising on their Facebook page. November 19th will be Tree of Hope Day at Dixie Lee. For every 3-piece dinner sold, Dixie Lee will donate $1.00 to the campaign. As well, staff will be donating tips and Dixie Lee will match that amount. Also on that day, patrons can buy a balloon with a prize inside, a coupon for a free pop or fries. Proceeds from balloon sales go to the campaign. All monies raised from Dixie Lee’s Tree of Hope campaign go directly to the charity. With the restaurants outdated POS system near collapse, Roy turned to Ron Pomerleau, RKP Atlantic, for help. RKP is POS-n-go’s dealer in Atlantic Canada. Pomerleau suggested the Elo PayPoint all-in-one POS machine running POS-n-go software. According to Roy, “The young people had no problem learning a new system.” It only took a short time for all employees “to get adjusted” to POS-n-go. Two POS-n-go features stand out for Roy. First, she can access all reports on a computer or the phone. “It reduced paper use” and is very convenient. Be sure to help out Dixie Lee in Shediac, NB with the Tree of Hope campaign. Stop in any time to make a donation, or mark November 19th on the calendar, head over and buy a 3-piece chicken dinner. One dollar for every dinner sold will be donated to the Tree of Hope campaign. Help out a great cause, taste a delicious fried chicken dinner at Dixie Lee, 366 Main St., Shediac, NB and be part of the Tree of Hope.